Today, reflecting different needs, the building houses the Russell Museum and a community library. The organisation is community focussed. Russell Museum aims to reflect the history of the town and to support historic preservation. 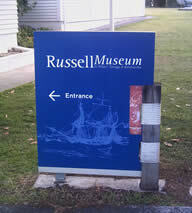 The museum’s collection is important in promoting New Zealand culture because Russell – then named Kororareka – lay at the threshold of the earliest connection of the two worlds of Maori and Pakeha. The collection dates from this time onwards. In 2002 it was decided that the Museum required a total facelift to keep pace with other tourist ventures. The Museum was going through a static period. The interior was in need of a coat of paint and a new lighting system. The display cases were 40 years old. Funds were required to bring about the changes. A museum consultant was brought on board. Plans were drawn up, ongoing applications for funding were made. Stage 1 was an area dedicated to Maori displays and artefacts and for a small souvenir shop within the museum. Stage 2 was devoted to the European influence on the town and an upgrade to the “Endeavour” wing. Stage 3 was the Marie King Gallery which incorporates a small theatre showing a historic video, a gallery space for changing exhibitions and a historic photo archive on computer. Work on the grounds is ongoing: a new shelter has been built for the whaleboat; landscaping is underway with native trees and plants being planted; featured in the grounds are a punga fence and seating, and a Rongoa Maori (medicinal plant) garden complete with explanatory signs; art works have been commissioned from local artists.